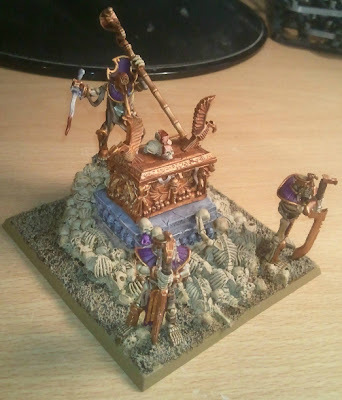 Last week I introduced you to the basic principles and concepts surrounding the creation of my Tomb Kings army, and showed you how I cheated my way to finishing the 75 skeletons required for my 2400 point list. Clearly Ra isn't a standard GW Tomb King mini, and there's a good(ish) reason for that. There's just too much detail on those models for me to tackle. 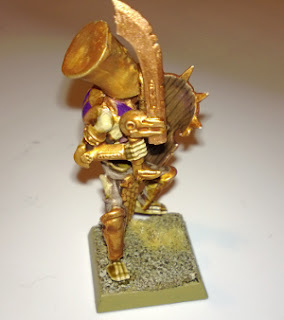 Given that I had chosen not to include Tomb Guard in my army, and given that I had deliberately minimized the level of extravagance present on the skeleton hoards, using some Tomb Guard seemed like an ideal way to make my characters stand out. Whilst I wasn't willing to subject myself to painting a 30 strong squad of the guard models, I felt that it was worth having a go with 3/4 of them, heavily customized of course, to try and give my army some unique characters. I had previously purchased the howdah from the Tomb Kings Warsphinx Kit on e-bay with a specific purpose in mind (more on that later) and the crew that came with it made the perfect starting point for Ra and his Generals. Additionally, during my search for weapons for the skeletons, I had gotten myself some Tomb Guard hand weapons and a few shields. 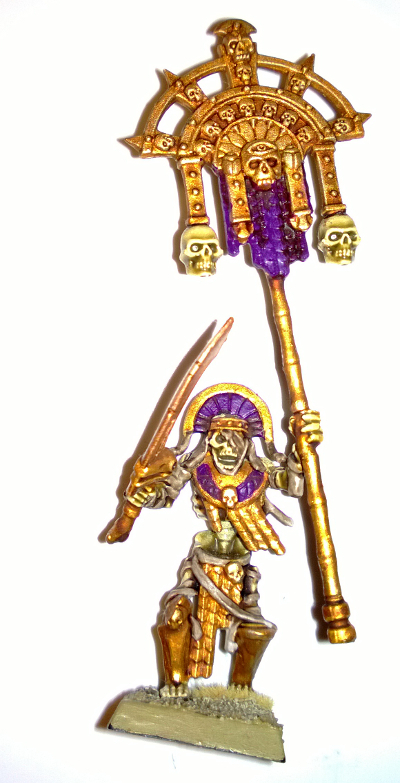 Bi'shop, again, is just a Tomb Guard from the Sphinx kit, holding the banner which is also from the Sphinx kit. 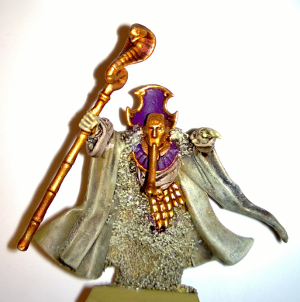 With the King and his Herald created it was time to move on to the Hierophant, the Lich Priest I wrote in to my list has the Cloak of the Dunes magic item, which grants its bearer the ability to transform in to a column of swirling sand to quickly fly across the battlefield. Given my penchant for converting individual characters I had a go at modelling a priest mid-transformation. Stick with me here because this stream of though is a tad convoluted but..... Initially, King Ra was so named and designed because of my particular love for the Sci-Fi series Stargate SG-1, whose stories all stem from the idea that the Ancient Egyptian Gods were actually aliens. These aliens, the Goa'uld, are protected by a slave race they created called the Jaffa. 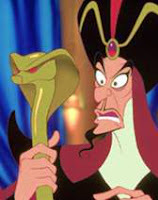 Since my King is inspired by the Ra from the series I wanted him to have Jaffa too, however when I hear the word Jaffa I am instantly reminded of the animated guy pictured above, Jaffar from Disney's Aladdin, a childhood favorite of mine. So yes, the snake staff and sinister beard of King Ra's Liche Priests are based on a children cartoon character, the parts themselves taken from the ever useful Empire Wizard kit. And here, my second Liche Priest, again with sinister beard and snake staff, and also holding what I like to call his "Your erernal reward!" knife. So after all that, what was my point here? Well I'm sure you can see from the pictures that these things aren't painted to perfection, even with the deliberate scale back of detail there are some obvious issues, some are exacerbated by the photography, but they are still issues. My goal in writing these articles is to show people that don't enjoy the painting side of their hobby, or feel they aren't skilled enough to attempt it, that there are ways to get an army painted that you are actually proud of. The big one in this piece is personalization (not a word) picking a theme that's quite unique and running with it, making a character from something a bit different, or modelling on a piece of war-gear from you army book in your own way can make you want to get your army painted so you can showcase your creation. On the painting front, the characters themselves were done with the same method and colours as the skeletons from Part 1. 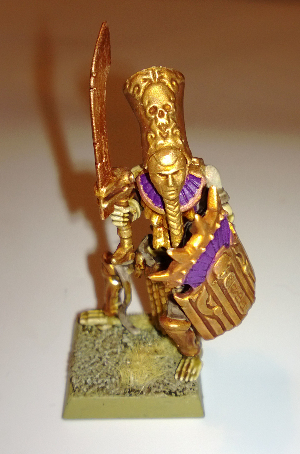 They were undercoated and dipped in Quickshade, and had the other colours added on afterwards, I decided not to give them the matte varnish coat as these guys aren't dead dry skeletons but are decaying (still alive) mummies, and the gloss of the Quickshade gives them that wet look. I personally think the Casket is my best looking model and it was so simple to paint. I left it in three parts, the pile of skeletons done in exactly the same way as the bone in Part 1, so very quick and easy. The golden casket is GW Shining Gold, Necron Compound dry brush and Gryphonne Sepia wash, and the stone base was Adeptus Battlegrey base with lighter shades of grey dry brushed on, all the way down to final light dry brush of white. That's all folks, thanks for reading, hopefully you'll tune in next time for..
Part III: And the Tomb Kings Rode to War. PS. An honorary mention next week to the person that can guess what I wanted the warsphinx howdah for. Nice work Glen. 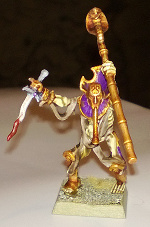 I particularly love the transforming Liche priest. I hope by the end of thia we get to see a whole army shot.